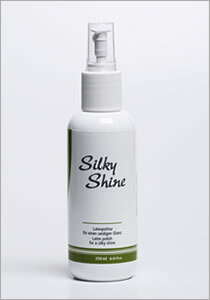 A latex polish that provides a silky shine. We recommend using it especially before storing your latex garments. Use a pump spray bottle, spray a little polish on the latex and distribute with a soft sponge. Allow to dry for a short time and your garment is ready for use or storage. Please store in a cold, dark place. The 250 ml bottle comes with a practical pump spray closure.